Warner Brothers avers it will provide frequent updates and photos "showing we are still on track to deliver this item in early April." Given the delays, perhaps WB should re-title it the 26th Anniversary Box Set. My previous post on the subject is available here. Once, long ago, two days after the Ides, on February 15, there took place in Rome a mysterious ritual called the Lupercalia, one of the many festival days named on the pre-Julian calendar. According to the ancient Roman scholar M. Terentius Varro, considered a reliable source on Roman religion, the Lupercalia consisted of a sacrifice made at the Lupercal (the cave where legend has it the she-wolf suckled Romulus and Remus) by the Luperci. Varro refers to a goddess named Luperca, whom he associates with the aforementioned she-wolf of Roman legend, and hence with the founding of Rome. But Ovid and Plutarch, in contrast, refer to a she-goat, suggesting for some scholars of ancient religions that no single god or goddess was necessarily associated with the festival. The ritual associated with Lupercalia is generally considered to have been a purification and fertility rite involving the sacrifice of goats and a dog. Once the sacrificed goats were dis-membered, the Luperci ran amok, lashing the participants with strips of flesh. Apparently wives were especially eager to be lashed by the Luperci with these bloody pieces of flesh, believing it promoted fertility and facilitated childbirth. (The goat-like satyr -- a later Roman conflation with Faunus, analogous to the Greek god Pan -- was to become a conventional symbol of carnal appetite.) The Lupercalia also consisted of great revelry and drinking, allowing one to infer that the birth rate in Rome significantly rose about nine months after the end of the festival, around the month of November. No wonder, then, that the Lupercalia survived the onset of Christianity, which required a different form and a different deity, the Roman martyr (as legend has it) Saint Valentinus. (The love for which he died, however, was of a higher form, not that of Eros.) The ancient form of expenditure, ritual sacrifice, is now, of course, replaced by a different kind of expenditure, a financial one, involving the purchase of expensive diamonds and jewels, the value of which is so dear because the financial loss is so tremendous. 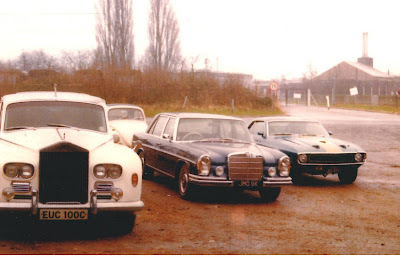 In yet another development regarding the ongoing search for John Lennon's white 1965 Rolls Royce Phantom V (see the previous and related posts), Steve Barratt in the UK, having read my post which started it all, The Ballad of John and Yoko's Rolls, kindly sent me a message in connection to the past history of EUC 100C. He correctly surmised that I would be quite interested in the following picture taken in 1971 featuring EUC 100C parked next to the automobile which he now owns (center), the Mercedes-Benz 6.3 once owned by Sixties pop star Donovan. Information on JMO 9K, and the fascinating story of its restoration, is available on Steve Barratt's website. Mr. Barratt's extensively restored Mercedes is classed as one of the best right hand drive models around, and was once on display at Mercedes-Benz World in England. I have not been able to verify the assertion, but Mr. Barratt believes the driver of EUC 100C at the time of the above snap was the famous rock 'n' roll bodyguard Alf Weaver. Eric Roberts, who has been conducting extensive research on the current disposition of EUC 100C, keenly observed about the state of the white Rolls in the above picture: "The twin inlets beneath the headlights are there, but the trophy "badges" usually mounted in front of the radiator are missing. Which is odd. (These "best of show" trophies must have come with the car - they are attached to PPB 1 in Georgy Girl.)" For images of the car as it appeared in Georgy Girl (1966), see the video attached to the previous blog post below. Like many of us, Mr. Barratt wants to find out the current whereabouts of EUC 100C, but he has a slightly different motivation: he would love to arrange to have a photo of JMO 9K taken next to EUC 100C again, thus reuniting the two famous vehicles after forty years. Mr. Barratt says, "Hopefully the current owner [of EUC 100C] should take me seriously when I find him and ask him about having a picture taken after forty years." I for one would love to see it happen. Postscript: Interestingly, the car worth the most money in the picture in today's market is the car at the far right, a Shelby. Apparently it is now worth a fortune, but was not so in 1971. Special thanks to Steve Barratt for permission to reproduce the above photograph. This video is presented for informational purposes only. Copyright is retained by the respective owners of the material. During the first months of 1966 in London, a hire company in Chelsea supplied the latest model Rolls Royce for the film Georgy Girl (filmed approximately January – March 1966, released the summer of 1966) starring Lynn Redgrave, James Mason, Alan Bates, and Charlotte Rampling. Shot in black and white, it is impossible to tell the color of the Phantom V, which plays a prominent supporting role in the film. Later the same year, around the time he met Yoko Ono, Lennon purchased this particular 1965 Phantom V from the hire firm. He ordered it to be re-sprayed and reupholstered in pristine white, and at the same time, an 8-track stereo, mobile phone system and polarized windows were installed. Please note: The number plate of the Phantom V in Georgy Girl is PPB1. Rob Geelen left the confirmation of this on the International Movie Car Database forum: "1965 Rolls Royce Phantom V Limousine By H. J. Mulliner, Park Ward design 2003 5VD63, delivered May 65 to to Patrick Barthropp Ltd., registered PPB1, and used in the movie Georgy Girl (UK, 1966), and subsequently by the Beatles. So not ordered new by Lennon." When in 1971 John and Yoko decided to settle in New York City, virtually everything they owned was left behind at Tittenhurst Park, including, presumably, their white 1965 Rolls Royce. Ringo Starr acquired Tittenhurst Park from Lennon in September 1973 and lived there until early 1988. At the end of 1985, EUC 100C was put up for a charity auction organized by Christies of London. It was withdrawn from sale and has not been seen in public since. After moving to New York, it appears that Lennon and Ono acquired a right hand drive white Phantom V to replace EUC 100C. Since 1999, Lennon's American Phantom V has been one of the main attractions in the Tebo Auto Collection in Colorado, USA. For more about EUC 100C and the search for its current whereabouts please visit: http://www.60x50.com/search/label/John%20Lennon.